There are many food flavors that just go so well together…….but nothing beats chocolate and peanut butter. I first posted a to die for Chocolate Fudge Peanut Butter Cake back in September and then I posted about our Krispie Peanut Butter balls I made at Christmas. Well today I have another Chocolate Peanut Butter combo for you that I think you’re REALLY going to like!! It’s super duper easy like the Chocolate Chip Brownie cookies that I posted in December. We’ve been wanting to try brownies in a cupcake form and when I made the chocolate cake with peanut butter filling we thought it would be good on brownies too. I recently saw a similar idea out there in blogville some where, but I didn’t bookmark it and now I can’t find it…..so if anyone knows where I may have seen this, can you let me know so I can link to it. 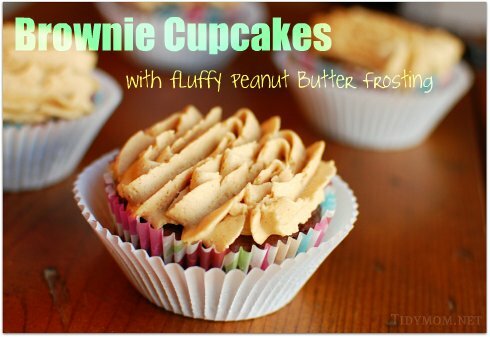 May I introduce to you………Brownie Cupcakes with Fluffy Peanut Butter Frosting! Add peanut butter chips and mix. Bake at 350° approximately 20 mins or until a tooth pick comes out clean. Don’t over bake. Beat butter and peanut butter in a medium bowl with an electric mixer. Add cream one tablespoon at a time until all of the sugar is mixed in and the frosting is thick. Beat for at least 3 minutes until nice and fluffy. Frost brownie cupcakes with frosting. I used a 1M tip, but you could spread with a knife if you want. I had extra frosting left over, and we had just made a batch of Betty Crocker Double Chocolate Chunk Cookies the day before…….so I sandwiched some frosting between two cookies for another tasty treat!! If you haven’t used those bag cookie mixes……you don’t know what you’re missing. They’re so easy and great when you want “homemade” cookies with out the time and mess! Are you a fan of TidyMom on Facebook yet? Click here if you’d like to be. YUM!!!! All my favorite flavors. I love it! Thanks for linking to Tempt My Tummy Tuesday. 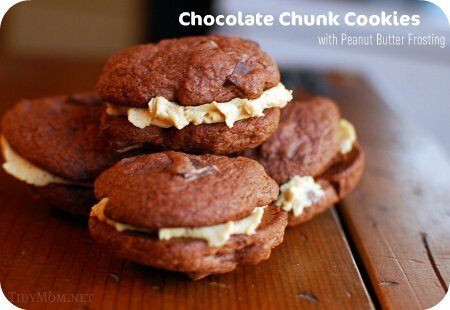 PB and chocolate…I'm in heaven! Love your blog! I will have to try these for sure. We love that combo in our house!! I just made this frosting to top the chocolate chocolate chip cookies I made last night. Yummmmm. Good thing I made it with milk instead of cream so it would be lower calorie…bahahahahaha!